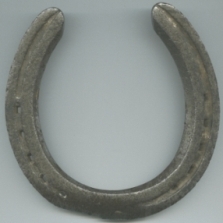 The many traditions behind the horseshoe superstitions all seem to be related to other symbols that deal with the solar circle, the half-circle, the half-circle, or the crescent, and the crotch of the human body. In Rajputana, India, temples were constructed on the plan of the horseshoe wherein yoni, or female phallic symbol was worshiped. Windows and doors designed in the horseshoe or arch style of architecture also represent the phallic symbol.